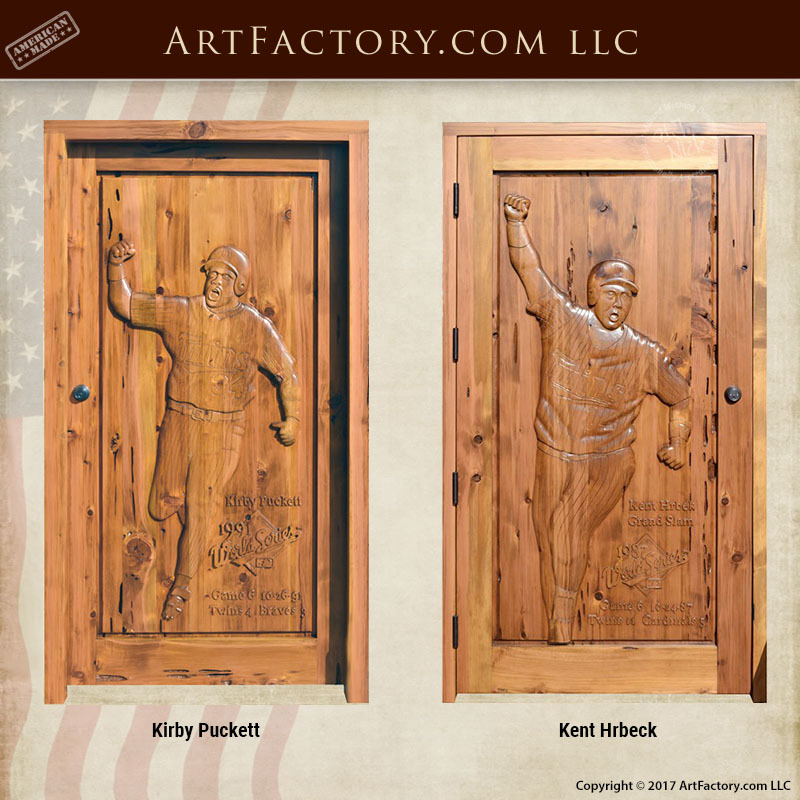 At ArtFactory.com we created these hand carved doors celebrate the Minnesota Twins 1987, and 1991 World Series Championships. The front side of the door shows Kirby Puckett pumping his fist as he rounds the bases. This was inspired by a famous picture that was taken after he hit the game winning home run in in game 6 of the 1991 World Series. You can see the famous photo by Sports Illustrated's John Iacono here (Kirby Puckett Fist Pump Photo). The back side of the door features fan favorite, first basemen Kent Hrbeck. This image was inspired by his grand slam in game 6 of the 1987 World Series against the St. Louis Cardinals. Unfortunately, for Minnesota fans, another championship in any sport has not come to the Twin Cities since. These doors are the perfect man cave entrance door for the avid sports fan. 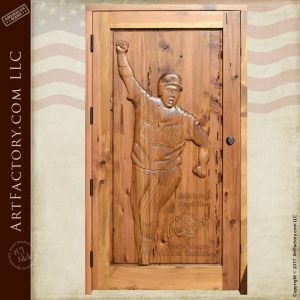 At ArtFactory.com we can hand carve a door for you featuring the likeness of your favorite athlete in any sport. If you aren't a sports fan, we have you covered. We also make doors featuring famous actors, our John Wayne hand carved door. We will carve your favorite musicians, super heroes, or any other hero of your choosing. Most importantly, these are one of a kind fine art carvings that will never be reproduced. Each door is a one of one. 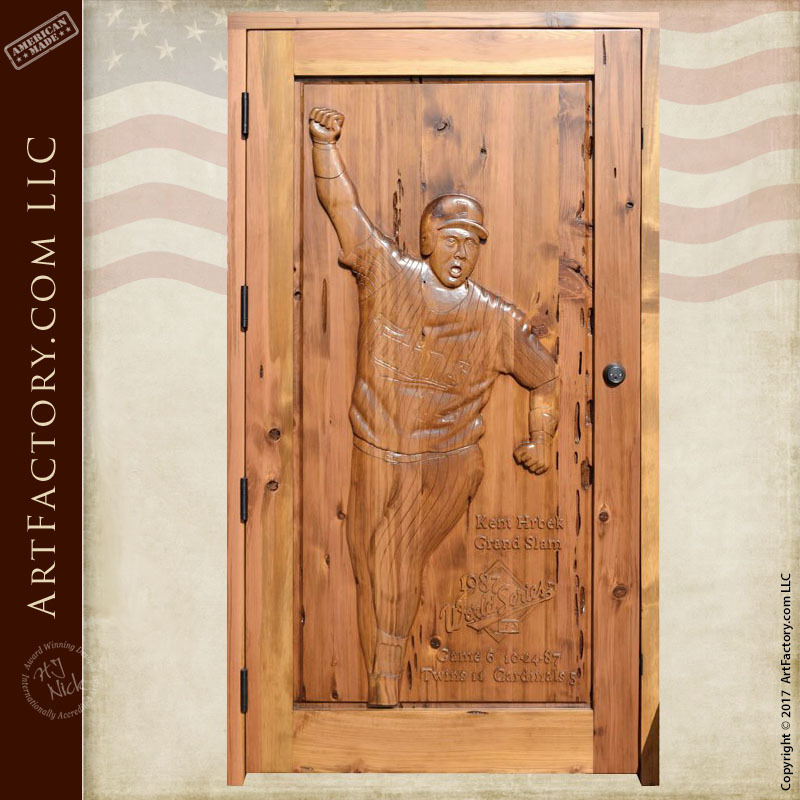 Show your team loyalty with your favorite sports hero hand carved into your man cave entrance door. You are their biggest fan, right This customer had a love for the Minnesota Twins, and wanted to memorialize their World Series achievements. He singled out Kent Hrbek, and Kirby Puckett for the honor. These two carvings are unavailable to be copied, by customer request. However, you can submit a photo or just have a chat with our art department to create your own original fine art carved door. The Minnesota Twins hand carved door was designed from a customer supplied photo. 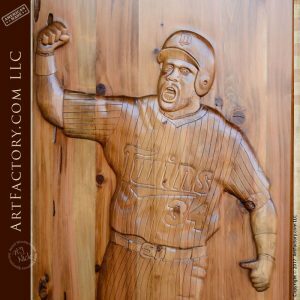 The Minnesota Twins hand carved door (as shown) is built from solid, thick, full length timber. Like all of our doors, it is hand hewn with mortise and tenon joinery. This means craftsmanship that is built to stand the test of time. We use only full length, natural, air dried timber. Additionally, includes structural jamb, 3-inch thick, with 1-inch rabbeted stop. This come standard on all of our pre-hung exterior doors with all weather package. All custom doors include adjustable heavy duty crush proof threshold, self-closing adjustable tension hinges, automatic mechanical door sweep, single cylinder deadbolt, and roller style door latches. Call us today at 1-800-292-0008 for pricing on the Minnesota Twins hand carved door, or any of our other custom man cave doors.